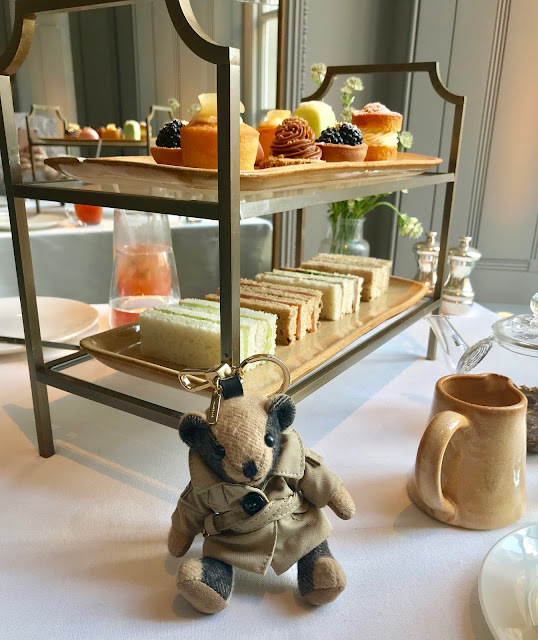 Whenever I visit London, I always try to make time to visit Burberry's Flagship store on Regent Street (the last time I visited, you may remember that I left with a very special addition here) but my latest visit was quite a special one, as I finally got to go and try afternoon tea at Thomas's! 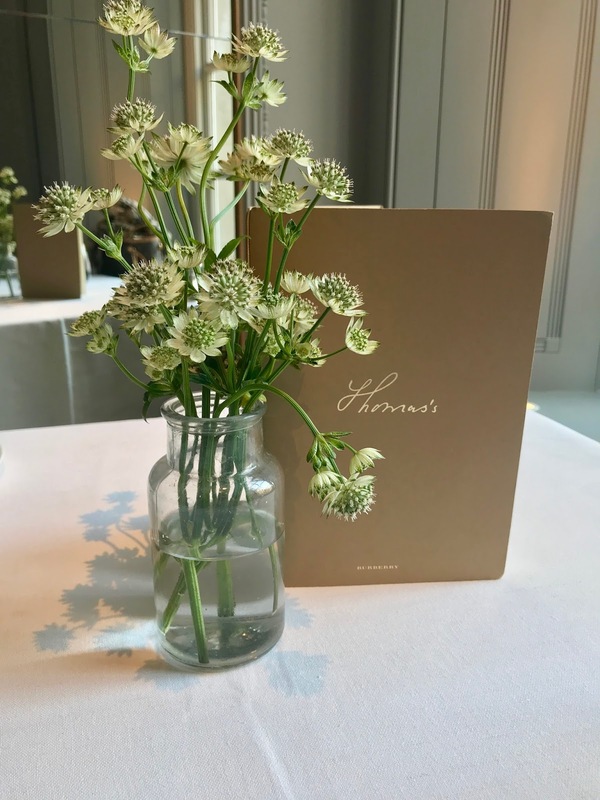 Thomas's is situated on the first floor of the flagship store and has a quintessentially British menu covering breakfast through to evening dining. 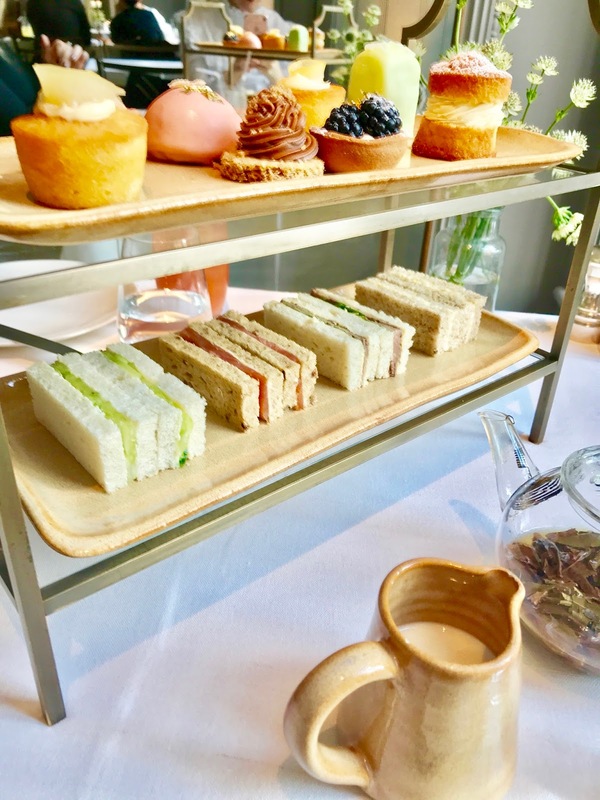 Afternoon tea is available throughout the day (you don't need to prebook it like you do for many other afternoon teas) as well as a selection of coffees, teas and scrumptious cakes, if you simply want to pop in to escape the hustle and bustle. The café is a little bit of a hidden gem; although I pre-booked our table, there were plenty available so walk-ins, at least on a weekday, look like they'd quite easily be accommodated. We were seated upstairs; it's much lighter and airier, perfect for taking photographs to show you our afternoon tea in all its glory!! On the menu, the recommended tea to accompany an afternoon's indulging of cakes and sandwiches is the 2014 2nd Flush Grand Reserve, Darjeeling, so I trusted Burberry's judgement (I mean who wouldn't?!) and went with that, but there's an option to exchange it for a different tea, coffee or juice. 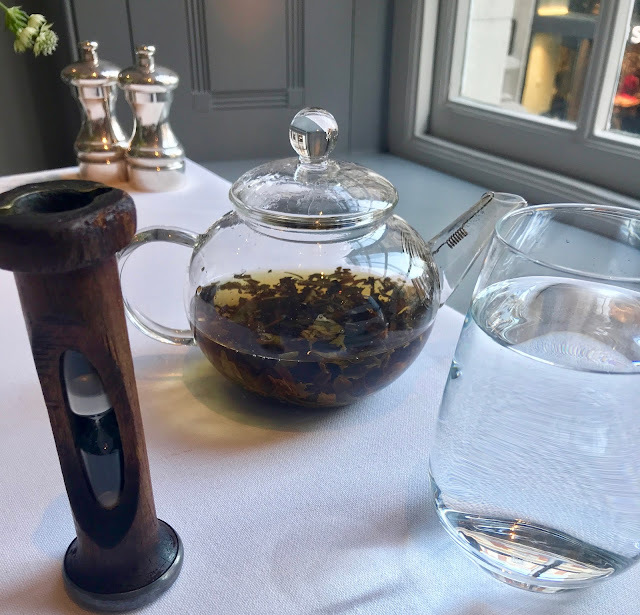 My Darjeeling came in a little transparent teapot, with a tea-timer (recommended brewing time was around five minutes). The shortbread that came with it was also pretty amazing! 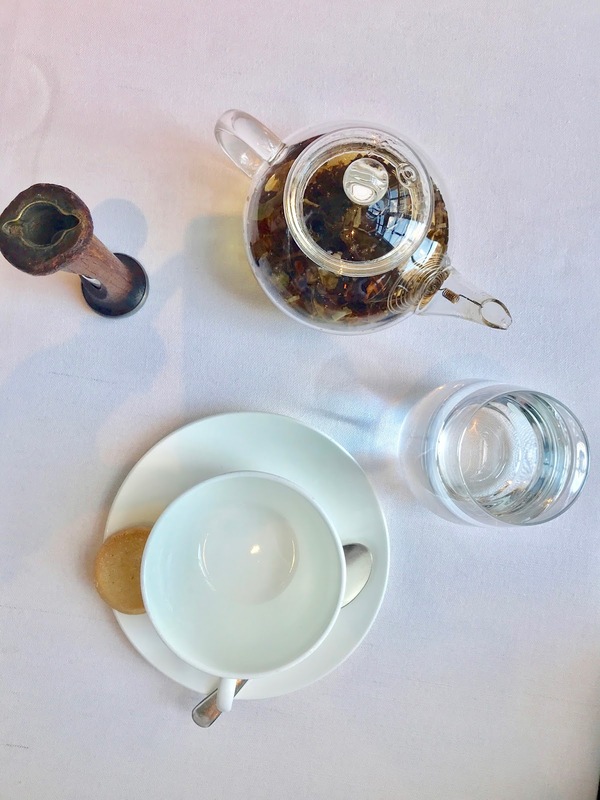 I'd describe the Darjeeling as a more refreshing version of an English Breakfast tea; definitely a great choice to accompany the food. Natalie doesn't drink tea, so had a non-alcoholic Raspberry Fizz. Both the juice and tea were refillable-the way afternoon tea should be! First to arrive was the cake stand, complete with sandwiches and gorgeous, dainty little cakes. The sandwiches were smoked salmon, cucumber and cream-cheese, roast-beef and horseradish and egg-mayonnaise (I'll come to the cakes a little later!). Each sandwich tasted delicious and super fresh, perfect food for our previously empty stomachs! 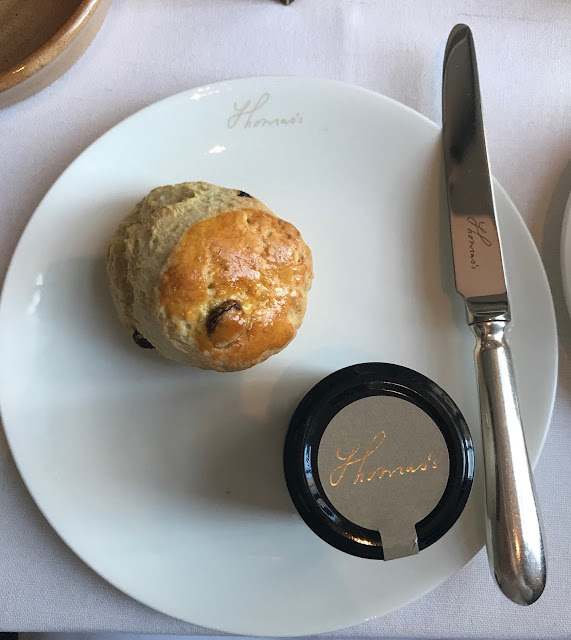 As well as sandwiches and cakes, there was a choice of something from the Aga (scones with clotted cream and jam, hot buttered crumpets or a toasted teacake). I chose scones and Natalie chose crumpets, so we could share. 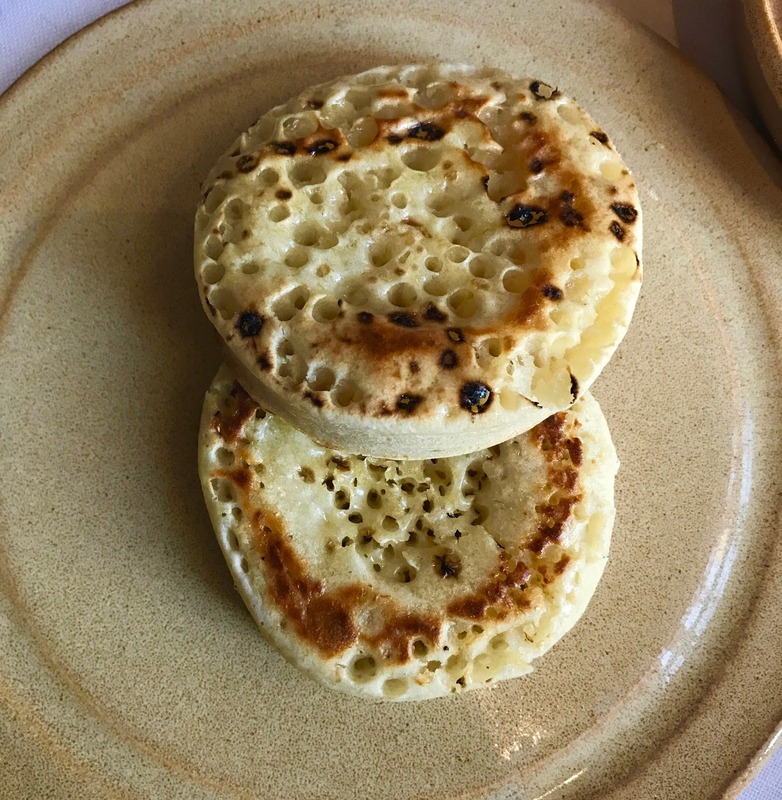 I've never had a crumpet as part of an afternoon tea before, but it's definitely a welcome addition! We had one each and they were sensational. Served in a heatproof dish, they were still piping hot and scrumptious when they arrived at our table; sheer perfection. The scones were pretty amazing too (in fact they were up there with the best I've ever had!). Natalie had the plain and I had the fruit and both were served with the option of Strawberry or Gooseberry and Elderflower jam with clotted cream. 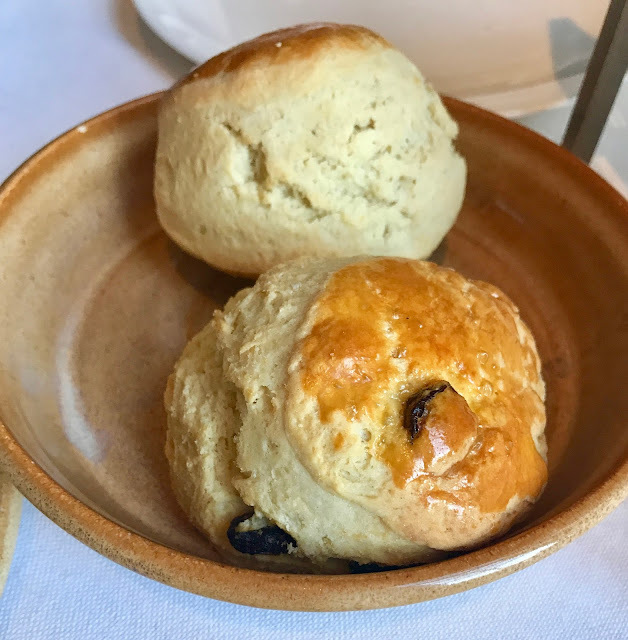 My fruit scone was a taste-sensation; but I was glad I had Natalie to share with as I don't think I could have eaten two! The cake layer was filled with delicious but mini tasty bites, the best way to ensure there's room for a bit of everything! 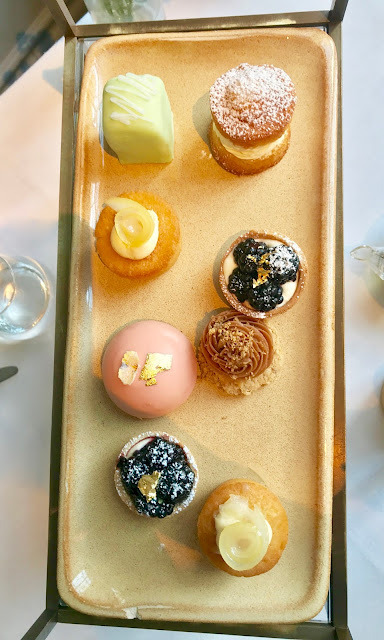 The cakes on offer were lemon (complete with lemon curd), blackberry tart, walnut whip, pink marshmallow, a Victoria sponge and a fondant fancy. The lemon was my favourite (and thankfully we had one each of these!) but the walnut whip was a close second. We halved the walnut whip, marshmallow and fondant fancy so we could try a little of everything. I wasn't keen on the berry tart, but this was purely down to preference; I couldn't fault any of the others-they were amazing! After clearing our plates (and the cake stand! 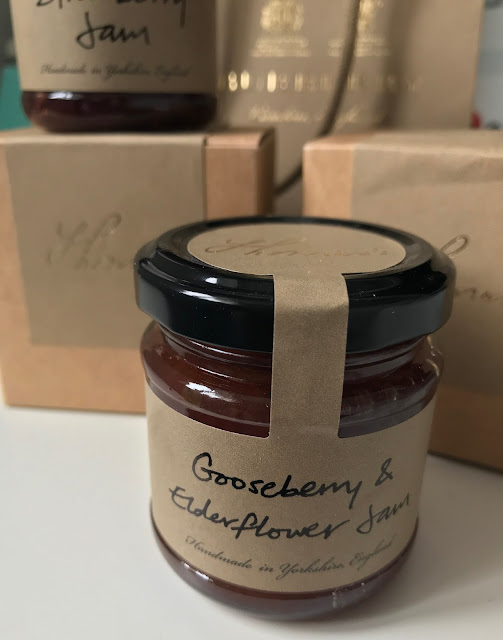 ), I was given the option of taking my jam home with me, a lovely little finishing touch. 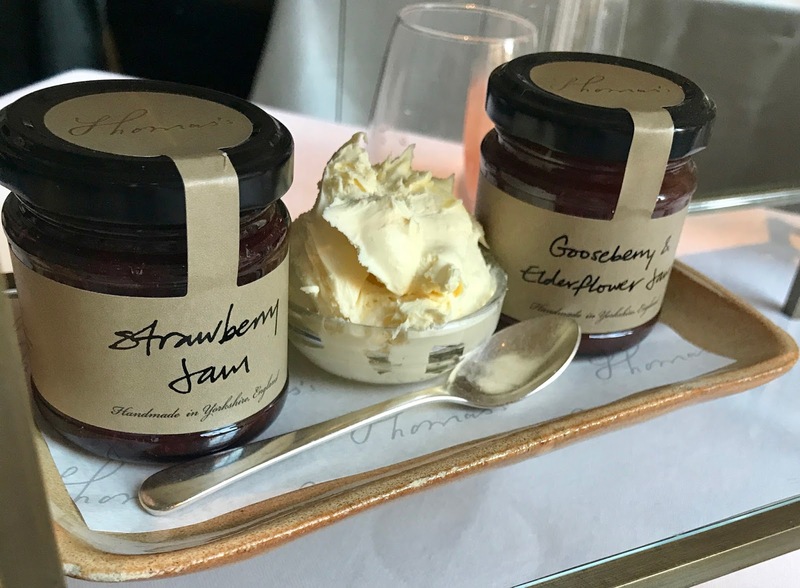 The Thomas's branded jam was a perfect souvenir of a wonderful afternoon eating delicious food with one of my favourite people! I love how cutely they were boxed, and it's been lovely to enjoy a little piece of Thomas's at home! After paying our bill, we wandered into the store to have a look around. I love the Regent Street flagship as there's always something interesting going on or something new to look at. This time, the full AW'17 collection was on display, so I spent my time building up a wishlist filled with military jackets and nova check! 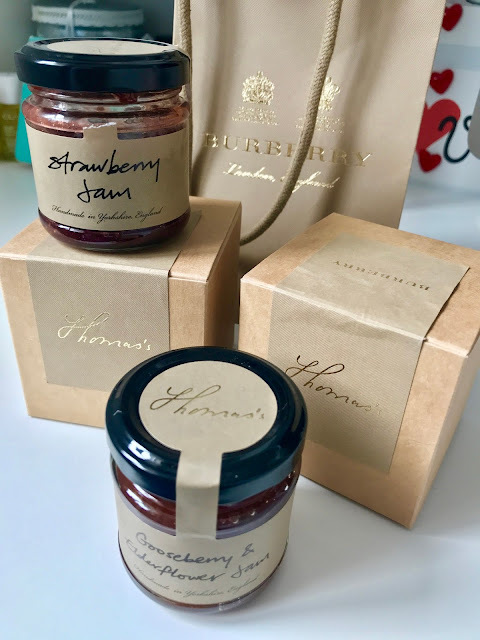 I couldn't leave empty-handed, so along with my jam, I made sure to repurchase my favourite lipstick; Burberry Kisses English Rose (No 17) and strutted out with two little brown bags-so much love for Burberry! Thank you Burberry for always making us feel so welcome-and making us want to come back again and again. The customer service at Burberry is outstanding; thank you for giving us such wonderful memories! Such a wonderful brand and a super flagship store! ...and Bertie had a wonderful time visiting all of his friends too!! 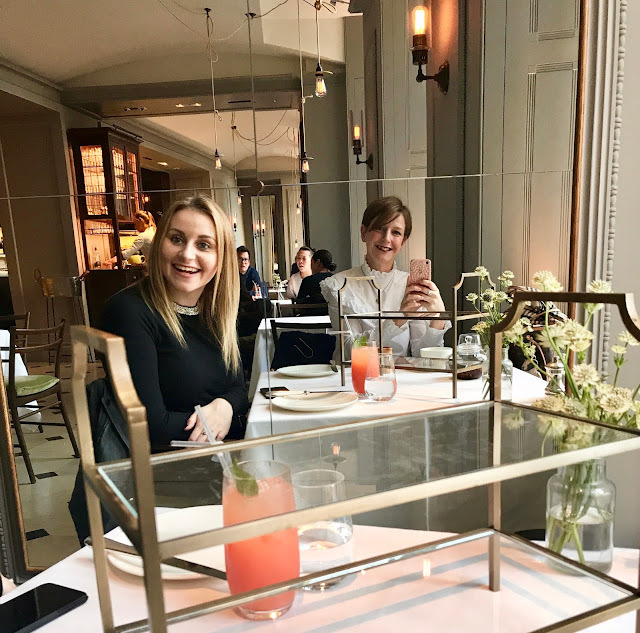 This is not a sponsored post; we visited 121 Regent Street and purchased our own afternoon tea from Thomas's. All opinions in this review are my own; I absolutely adore Burberry and have only good things to say about the staff and the brand-simply perfect! Wow that afternoon tea looks delicious! I bet so many people don't realise you can do it!